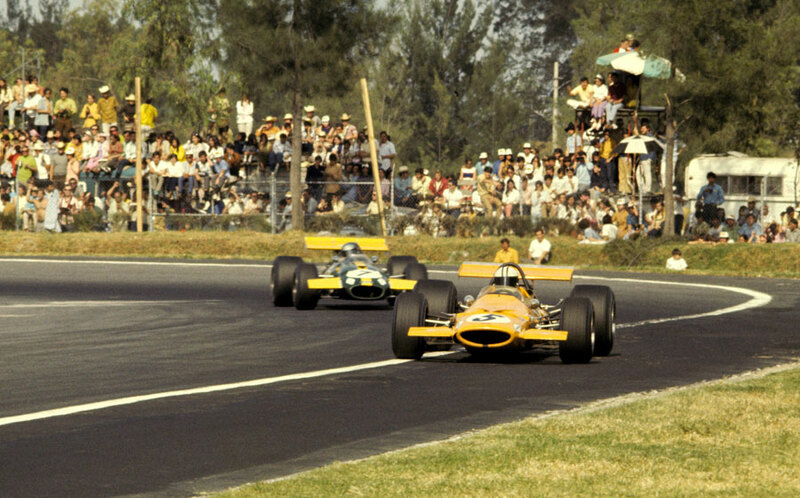 Denny Hulme beat Jacky Ickx by less than three seconds in the season finale in Mexico, a thrilling conclusion to a remarkable year. For Hulme it helped ease memories of a wretched season in the McLaren M7A. The race was also notable for the superiority of Goodyear tyres over the Dunlops used by Jackie Stewart and much of the field. On the US rubber, the Brabhams of Ickx and Jack Brabham looked in a different league as they sat on the front row of the grid. But Stewart made a great start to lead for five laps before Ickx managed to pass, while Hulme had to find his way past Jochen Rindt and Brabham. Two laps after surrendering the lead Hill also lost out to Hulme; thereafter the front two battled wheel-to-wheel until Hulme was able to pull away. Ickx was not beaten and from 12 seconds down with 15 laps remaining he gradually closed the gap, egged on by an enthusiastic crowd, setting the fastest lap on the penultimate circuit. In the end Hulme held on but it was tight. Veteran Brabham took third place with Stewart back in fourth. "I'm satisfied," Stewart said. "There was nothing wrong with my car. Denis just drove a great race." Watkins Glen winner Rindt was running fifth mid-way through the race when he damaged his suspension attacking a kerb and retired, leaving Jean-Pierre Beltoise to inherit fifth and Jackie Oliver to score his first point of the season in sixth.